If you’re reading the Bible along with me you will have been reading Numbers this month. I don’t mean to sound blasphemous, but I usually don’t adore Numbers. I haven’t liked them in math, and I haven’t enjoyed them in scripture. But, yesterday three things jumped out at me so profoundly that I have to share them here. The first is this: “Now the people complained about their hardships in the hearing of The Lord, and when he heard them his anger was aroused.” (Numbers 11:1) When I read this, I shut my eyes in shame. Complaining, thy name is the teacher’s lounge. Complaining, thy name is my frustration with government, with traffic, with thousands of petty annoyances throughout the day. Then, I find this verse in the next chapter: “Now Moses was a very humble man, more humble than anyone else on the face of the earth.” (Numbers 12:3) I shut my eyes and thought of my pridefulness. Am I content with being a teacher? No, I have to have a Masters, I have to have National Board Certification, I have to display my honors and recognition on the wall by my desk. I pray my son does well in the Marines, and then I find myself thrilling to his words that his company ranked the highest in the latest drills. There’s a fine line between achieving excellence, which I believe we are called to do, and between having a false sense of pride over our accomplishments. The best books (religious or not) are the ones that make you think and reconsider yourself and your life's path. Something we all need to do more often. I really like that quote by C.S. Lewis: we should be proud of our own achievements, but not in the light of that forget about the rest of the world. Thanks for your sharing, Bellezza, and the reminder. Yes, it's amazing, isn't it, that 'even' the Book of Numbers have precious lessons for us to learn. I've been enjoying your posts on your Bible reading. Thanks again. What incredibly convicting verses. I've had quite the eye-opening day today when it comes to seeing how I speak and how terribly sinful most of what I say is. After reflecting on what a mess of complaining and anger and bitterness just last week was in my speech alone, I worry that if I go into this week determined to make a change that I might not have anything to say at all. That's how much time I spend complaining, being angry, and being prideful. Maybe just learning to be a little more quiet and a little more thoughtful will make a good start. I wish I'd started out the year joining you in your Bible reading. I might just have to pick up now. Thanks for sharing what you're learning! What a fantastic post. “There's a fine line between achieving excellence, which I believe we are called to do, and between having a false sense of pride over our accomplishments.” I need to remember that. I have tried to read the bible but just didn't make it through. And yes, I REALLY gave it a go. It makes it easier though when I have someone to read it with me and we can discuss the passages together! I love this post! Reading the scriptures during Lent is a great idea. I'm using the Black Book for Lent. That's one of my favorite parts about reading: looking at the characters' lives and wondering what I would do the same (or many times, differently!). I love when an author teaches me something from his or her story. The C. S. Lewis quote really struck me. He has a way of doing that, though. I tend to think of Numbers, Deuteronomy and Leviticus as nothing but law. That is so erroneous of me. Law is good, even though the New Testament negates much of is, but when I find these nuggets of truth within the geneology and rules they really thrill me. I think Sunday is a good day for wrapping up the Bible reading passages, isn't it? Megan, I think we live in a world of complainers and blamers, and if we're not very careful we get sucked into it, too. I have to be quite conscientious of what comes out of my mouth, and it's a daily prayer that He makes me pleasing in His sight. Don't worry about what you've missed in the reading so far, join in now if you'd like. The readings are listed in a post if you click on the Bible picture in my sidebar. I have been taught all my life to do my best, and I completely agree with that philosophy. I just have to check myself when I find a sense of my own achievements usurping a sense of humility. It's so easy for me to fall into pride, while at the same time being insecure. Can you explain that?! I've read it through at least twelve times in my life, and it's not necessarily an easy task. I find it more manageable when I have a translation which is clear to me, and a daily reading plan. Otherwise, one can feel overwhelmed! As I replied to Megan above, feel free to jump in with us now. 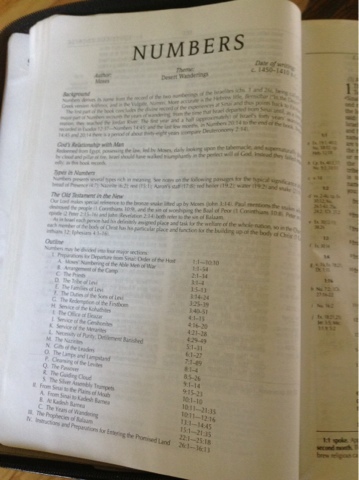 The readings are listed if you'll click on the Bible photograph at the top of my sidebar. I'd love to have you both read with me. I'm not sure what the Black Book for Lent is, Edgar. I'll have to look it up. I have a Book of Common Prayer, but I'm not Episcopalian and so I get a little lost with it. But, I do love the ancient prayers offered up. I found it on Barnes and Noble here. I've downloaded a sample for my nook, so thanks for telling me about it, Edgar. It's amusing. There probably are a million posts out there in Bloggieland about how to deal with negative comments, sniping and criticism. I've never read a single one about dealing with compliments, appreciation and praise. In a very real sense, maintaining a blog of some quality (I'll not say what!) has led to a continual engagement with this issue. When someone says “Beautiful!”, and means it, and I know they're right – what is the right response? To say, “Oh, it's nothing?” That's dishonest, because if it's a good post, it most assuredly is something. If nothing else, it's several hours, if not days, working at the computer. Blogging as a spiritual learning lab? Who'd imagine that? But it's true – learning to accept praise without negating it or denigrating ourselves is part of humility, too. Both take some energy and attention. Isn't it ironic how easy it is to focus on the negative completely bypassing the positive? I try so hard not to do that in my life, and yet it creeps in against my will. It's clear how much thought you put into what you write, Linda; your posts are not simply dashed off and published. I don't think it's bad to acknowledge one's acheivements either. Where it becomes 'bad' is when that is the focus rather than the person's heart or motive. Numbers is a difficult book to get through. It's nice you found some important nuggets of truth there.